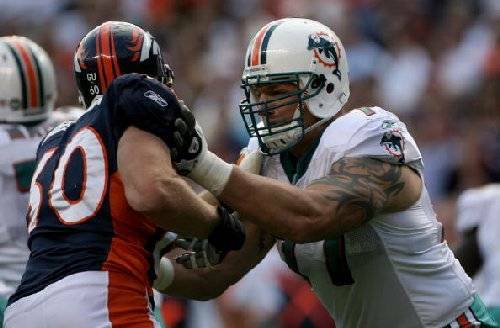 The Dolphins may have to look to place the franchise tag on offensive tackle Jake Long next season this according to the Miami Herald. Now that the Dolphins have extended Cameron Wake, the team is mulling which potential 2013 free agents they should sign next. Randy Starks and Anthony Fasano said Miami has not made offers (though Starks will be eventually, from what we hear), and Reggie Bush surprisingly has not been approached. Jake Long said he is unaware of any contract talks, but Miami will use the franchise tag on him next spring if a deal isn’t reached. Expect offers eventually to Brian Hartline and Sean Smith, entering the last year of their deals.